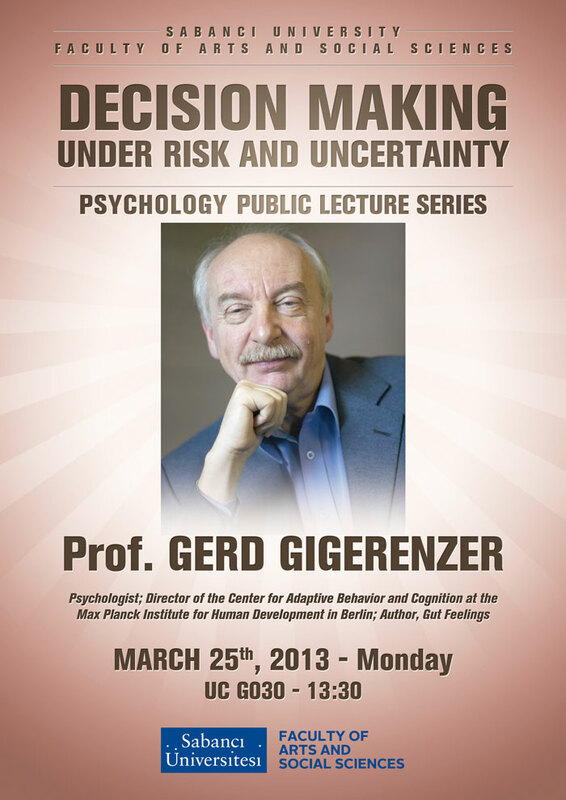 Prof. Gerd Gigerenzer, 25 Mart 2013 Pazartesi günü Psikoloji Public Lecture'i vermek için SSBF'yi ziyaret ediyor. Halen Berlin'de bulunan Max Planck Enstitüsü, Center for Adaptive Behavior and Cognition isimli merkezin direktörlüğünü yapmakta olan Gerd Gigerenzer, University of Chicago'nun eski öğretim üyelerindendir. AAAS Ödülleri'nde Davranış Bilimleri alanında en iyi makale ödülünü kazanmıştır. Gut Feelings ve Almanca çevirisi 2002'de yılın kitabı ödülünü kazanmış Calculated Risks: How To Know When Numbers Deceive You kitaplarının yazarıdır. Gigerenzer ayrıca Buluşsal Yöntemler üzerine Simple Heuristics That Make Us Smart (Peter Todd & The ABC Research Group ile) ve Bounded Rationality: The Adaptive Toolbox (nobel ödüllü ekonomist Reinhard Selten ile) başlıklı iki de akademik kitap yazmıştır. There are risks that are known, and others that are unknown. In worlds of known risks, statistical thinking can provide the optimal course of action. The challenge here is in the art of risk communication, which is rarely taught. For instance, most doctors do not understand the outcomes of their tests. We have developed simple tools that help both doctors and patients to understand health statistics. In worlds of unknown risks, however, understanding statistics is not enough. Here, simple heuristics and good intuition are needed. A heuristic can find smart solutions by focusing on only a few cues and ignoring the rest. I will explain how heuristics work. They are embodied in the sense that they can exploit capacities of the human mind (such as recognition memory), which facilitates quick judgments. They are anchored in the environment in the sense that they can exploit statistical or social structures (such as signal-to-noise ratio). The study of the ecological rationality of heuristics provides a novel and general account to understand why and when less can be more.